This afternoon I stood around an old hotel room in Middletown with about 10 people, eating vegetable soup, sweating, listening to an antique radio, and loving it. And this is part of my job! I can't believe I get to make movies, like as part of my job. But yet at the same, I also have health insurance. I think I'm probably the most blessed person I know. Who else gets away with this? And on top of it all, my wife goes along with it. She actually helps on crew and allowed a 15 to 20 person film crew to invade our home for 15 days. Don't misunderstand, we work hard. We work really really hard at times. And sometimes we get really stressed. But then there are moments like I described above and I can't imagine too many things that are too much better. 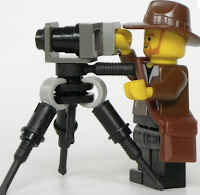 This filmmaking stuff is like being 9 years old again, working on a monstrous lego sculpture; sometimes the pieces don't fit like you want them to or a block falls off, but you work through it, slaving away at your creation, loving it, and in the end you can't wait to show off what you just made.